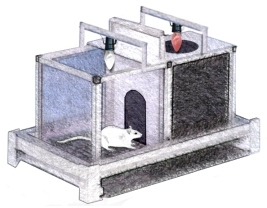 In the light/dark preference test (test of emergence neophobia), the activity of a rat or mouse in the light and dark portions of a box are recorded. The rodent’s avoidance of the lighted portion of the apparatus suggests elevated anxiety, while showing little or no preference for the dark area of the enclosure suggests a lack of anxiety. This test is useful in determining the potential anti-anxiety or anxiogenic effects of drugs or detecting damage to the limbic system.